Ryan Helsley pitches in a 2018 spring training game. ST. LOUIS – The St. Louis Cardinals made six roster moves, adding four players to the 40-man major league roster and designating two players for assignment in advance of Tuesday’s reserve list deadline. The Cardinals selected the contracts of left-hander Genesis Cabrera, right-hander Ryan Helsley, outfielder Lane Thomas and infielder Ramón Urías from Triple-A Memphis. They also DFA’d right-handers Conner Greene and Derian Gonzalez, leaving their 40-man roster full. Cabrera, 22, came to the Cardinals in July in the Tommy Pham trade with Tampa Bay. He went a combined 8-9 with a 4.17 ERA and 148 strikeouts in 27 games (25 starts) between Double-A Montgomery, Double-A Springfield and Memphis. Helsley, 24, was a fifth-round pick out of Northeastern State (Okla.) in 2015. 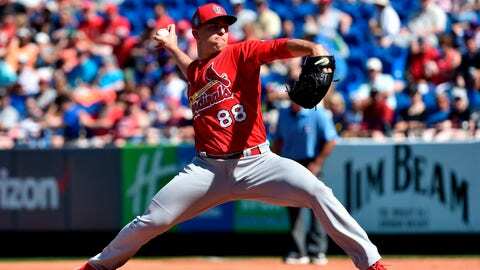 He went 5-3 with a 3.97 ERA and 82 strikeouts in 13 games with three clubs (Springfield, Memphis and the Class A GCL Cardinals) while recovering from shoulder fatigue. Helsley was the 2017 Florida State League Most Valuable Pitcher. Thomas, 23, was acquired in July 2017 from Toronto in exchange for international cap space. The right-handed hitting center fielder batted a combined .264 with 27 home runs, six triples, 23 doubles, 88 RBIs, 84 runs and 17 stolen bases in 132 games between Springfield and Memphis last season. Thomas was a 2018 Texas League Mid-Season and Post-Season All-Star for Springfield before his promotion to Memphis. Urías, 24, started at every infield position, including 48 at second base, while playing 90 games between Springfield and Memphis last season, his first in the Cardinals organization. He batted a combined .300 with 13 home runs, 44 RBIs and 28 doubles. Urías played for five years (2013-17) in the Mexican League and was a Mexican League All-Star in 2017.